Until now, I hadn't seen a Swiss Army Knife with a laser pointer, but the Signature Laser neatly solves the classic problem of pointing things out. You'll no longer have to explain where something is -- just paint it with the laser beam. This would have been extremely handy on the Camouflage Detection Range. Of course, the real uses pertain more to lectures and business meetings than to woodscraft, but with this handy pocket knife available, anything within 70 feet is in peril of being marked with a glowing red dot, even if just for fun. The knife also includes nail clipper scissors, a nail file with a squared point that doubles as a screwdriver, a retractable ball point pen, key ring, and of course a small penknife blade of high carbon stainless steel. Other perks include a much better night-time range of up to 300 feet and pressurized ink in the ball point pen, which makes the knife write in any position. Electronic power-saving circuitry behind the ruby-red handle conserves the charge of the tiny battery cell that powers the laser beam. Only 2.5 inches long, the most useful thing in the knife is still the fine-edged knife blade, but the laser pointer is simply irresistible. You'll be pointing out things you never even noticed before. All Swiss Army knives from Victorinox carry a lifetime guarantee. Even the smallest versions like the Signature Laser are built with precision and qualify as reliable tools. 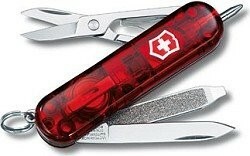 See the Swiss Army Memory Stick Knife for another classic pocket knife with very modern potentials. Victorinox Swiss Army Classic Pocket Knife | SD Tool | Red, Pink, Green, etc.